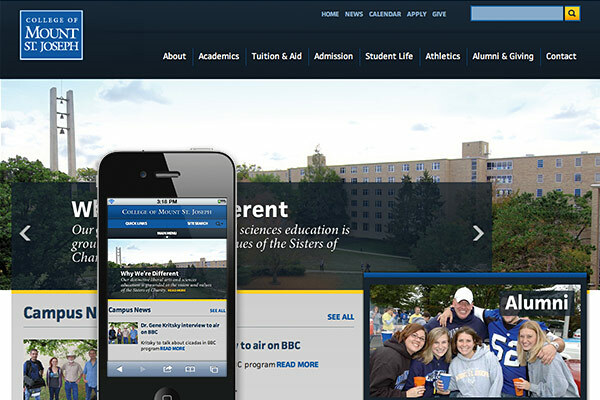 The College of Mount St. Joseph has the distinction of having one of the first fully responsive collegiate websites in the country, and we had a great time doing it. The College of Mount St. Joseph has been proudly educating students in Southwestern Ohio for nearly one hundred years. Now, they are able to add to their decorated list of accomplishments the distinction of being one of the first colleges in the country with a fully responsive site. They came to us with the opportunity to rework the nearly 1,600-page site, top-to-bottom, including planning, content strategy, design, and a shiny new CMS. A formidable challenge. We were happy to oblige. After a complete rework of site audience, goals, and architecture, the original site’s page volume was reduced, reprioritized, and restructured. We had a unique opportunity to create navigation that would accommodate a site that, though smaller in size than when we started, was still vast. The result? Check it out for yourselves. And should you or your kids decide to apply with the good folks in admissions, tell them Sparkbox sent you (they promised us a tasty discount in their dining hall).